A charming inn housed in the former premises of a deconsecrated chapel in the vineyards of Chianti. 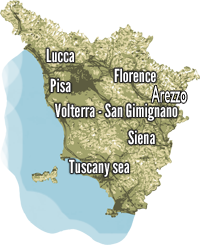 You arrive at the inn along a narrow country road through the vineyards of the Val di Pesa, near Florence. The Old Chapel is situated on a hilltop in a panoramic position on each side and you can enjoy a spectacular view over the hills planted with vines and olive trees. The view is that of Chianti and in the distance you see the towers of the ancient town of San Gimignano. It has 15 spacious and tastefully decorated rooms in an elegant Tuscan style: exposed beams, wooden floors, warm colors and relaxing for the upholstery. All have private bathroom with shower, air conditioning or heating and TV in each room is characterized by the different colors for walls and curtains, and some are on the first floor with internal access to the Inn, while the others are on the floor floor with separate entrance from the garden. On the ground floor are situated the reception, large dining room with patio garden and kitchen. On the first floor common rooms, comfortable and classically furnished rooms: the lounge bar with television, fireplace hall and gaming room. In winter as in summer you can spend time relaxing by playing cards, reading a book or sipping a glass of wine. Ideal for a romantic weekend in Tuscany. The garden is large and very well maintained, enriched with lavender, roses and rosemary. The pool and sun deck area are just a few steps from the inn. All around the meadows shaded by olive trees and some pine trees, in addition to the patio with loungers for sun lovers. Guests are also the gazebo with a small seated area, a dressing room with shower, toilet and refrigerator. The total price includes: towels, bed linen (pillowcases, sheets, pillows, blankets), daily cleaning, heating / air conditioning. swimming poolPing Pong, Outdoor Parking. Drinks and anything else not expressly mentioned.